Probably my favorite cheaper beer. I used to drink this in college before I really got into beer but I would still go for one of these if it were at a friend's house or party. Weak is the watchword on this beer. 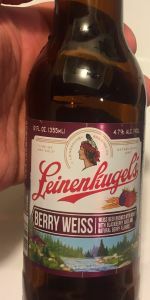 It's a "weiss" (I guess they mean weizen) and it has berry flavor but the flavor is vaguely sour, slightly sweet and very lightly fakish berry. Only if it's a hot day and nothing else is there. If you're expecting a Belgian fruited ale or a German Weizen mit Schuss, walk on by. Yeah, I know, it's not a true craft beer, but it tastes like juice in the best way possible. Stop being a snot and actually enjoy a beverage that tastes good.